It was a chance to help people and see a different part of the world. 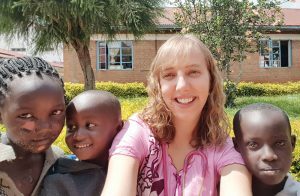 Rhianne den Toom, a nurse at the Willow Creek Continuing Care Centre, spent almost a month volunteering with Samaritan’s Purse at Kapsowar Hospital in Kenya. “I got a chance to do a lot of different things,” she said. When den Toom arrived, she observed the nursing standards are quite different. There were also a lot of barriers with some limited access to resources such as x-rays and bloodwork. She also learned that volunteer nursing is a balancing act. They were there to help, but not be a “know-it-all” and inadvertently discourage the nurses there. den Toom, who was there from Nov. 20 to Dec. 16, experienced everything from labour delivery, pediatrics, and community health, to men’s and women’s surgical departments, medical departments, and assisted with surgeries. “It was a chance to help out all over,” she said. The number of patients varied from day to day, with some staying a long time while others required less treatment. The days were long too, starting at 7:30 a.m. and running to 8 p.m.
Kapsowar is in a mountainous area of Kenya that receives a fair bit of rain. She stayed at a compound in a little house, walking distance to the hospital, that was fenced with security all night, and the gates closed at night. The visiting doctors also stayed there. Two were from the United States who had been volunteering there for a few years. Working closely with them was a highlight for den Toom. “They are so welcoming,” she said, adding they would invite her for dinner. “They check up on you. Moreover, everybody was encouraging to each other. “You really get a blessing by being a blessing to them,” den Toom said. She grew up on a farm between Granum and Nobleford. She did her nursing training first at Lethbridge College then went on to earn her degree at the University of Lethbridge. She has been at the Willow Creek Continuing Care Centre about a year. Nursing overseas was something den Toom has wanted to do for awhile, but she wanted to work and gain some experience first. Once she did, she chose Samaritan’s Purse because she had a friend who had a relationship working with the organization. The application process involved a lot of paperwork that included getting travel insurance, ensuring her nursing licence was in order in Kenya, and much more. It is an experience she would like to repeat.